Bosses Find Part-Time Workers Can Come With Full-Time Headaches : Shots - Health News Some fast-food franchisees are rethinking putting workers on part-time status to avoid having to provide them with health insurance. The business hassles are exceeding the savings. 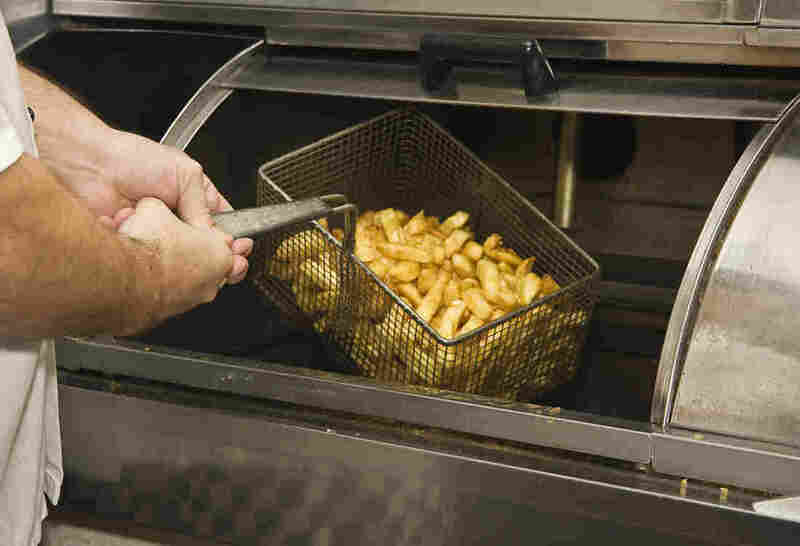 Skimping on health insurance carries a hidden price for some fast-food restaurants. Starting in 2016, the federal health law requires small employers to offer their full-time workers health insurance. In anticipation of the change, some fast-food restaurants looked to get around the law by making more workers part time. Now some owners are rethinking that approach. At a Burger King off Highway 99 in California's Central Valley, a half-dozen workers in black uniforms scurry around, grabbing packets of ketchup and stuffing paper bags with french fries. Mua says that's the situation at fast-food joints all over town. "They're cutting back on all the jobs, and a lot of people have been let go and everything already," Mua says. One reason: The local economy is bad. People aren't eating out as much, and sales are down. But there's another reason that might explain why fast-food employees aren't getting more hours: Obamacare. Starting Jan. 1, businesses with 50 or more full-time employees must offer health insurance to all full-time staff or pay a hefty fine. Employers with 100 or more workers had to start offering coverage last year. But smaller businesses that operate on lower margins, especially restaurants, complained loudly about the cost. And some fast-food franchise owners figured out a way to avoid paying for coverage: Just make as many workers as possible part time. A U.S. Chamber of Commerce survey found nearly 60 percent of small franchise businesses said they would make personnel changes like this. "The ones that did it successfully did it three or four years ago," says Kaya Bromley, an attorney who helps employers comply with the Affordable Care Act. But, Bromley says, some of the restaurant owners who cut hours to sidestep the health law now regret it. "A lot of the fast-food franchisees that did this," she says, "are now coming back and saying, 'it was a great idea for reducing the number of people that I have to offer benefits, but now I can't run my restaurants.' "
"Because you've got people who are less loyal, you've got people who are less skilled — who don't understand the business," she says. There's also more employee turnover. Bromley has seen many of those restaurants reverse course. "Employers think that there's a shortcut here or there, and then they realize, yeah, that shortcut really hurt me more than it helped me," she says. The people hurt most by all the workforce management gymnastics are the people at the bottom of the restaurant pecking order who want to advance, but can't, says Angelo Amador, vice president of labor and workforce policy for the National Restaurant Association. "Someone who's working part time, but wants more hours so they can move up the ladder, they can't get the hours," he says. "It ends up taking out that middle rung of employees." Obamacare has made restaurants less flexible, he says, mainly because it defines full-time work as 30 hours a week or more. Amador says most other laws restaurants have to comply with, like overtime pay, define full time as 40 hours. He thinks the Affordable Care Act should be changed for consistency. "It would be much easier if we could have one definition of full time," he says. At the Carl's Junior in Chowchilla, Calif., manager Silvia Campos tries to keep as many workers full time as possible. She says it makes her job easier. "It's a small town," she says. "For me, it's hard to find a really good employee." But some workers don't want more hours. Their part-time salary is low enough that they're eligible for government coverage in California through Medicaid. Some workers say they're better off making less money and getting their coverage free from the state. This story comes from a reporting partnership of NPR, KQED and Kaiser Health News.